Four years ago, when I tossed a coin over my shoulder into the Trevi fountain while visiting Rome, little did I know that the wish I made to return one day to my grandparents’ homeland would come true this fall. 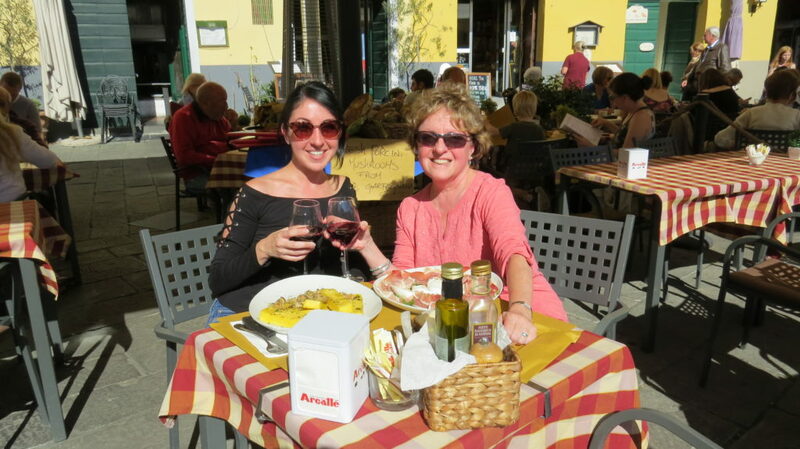 A few weeks ago, my daughter, Christina, and I embarked on what was to be a fabulous mother/daughter “most excellent adventure” exploring the hillsides of scenic Tuscany. We went with a tour group of 40 people who turned out to be the friendliest, most fun group of people I’ve ever had the pleasure of spending nine days with! We laughed our way through every day, feasted on large quantities of amazing Italian food, enjoyed the best chianti and locally produced wines, and walked and climbed and walked and climbed some more — surely burning off every one of the thousands of calories that we consumed! We stayed in a beautiful little boutique hotel in the centrally located town of Montacatini Terme. Early every morning, our driver, Franco, welcomed us aboard our tour bus as we set out to visit a new destination – each town more beautiful and captivating than the one we visited the day before!! We visited Florence, Lucca, Siena, San Gimignano and the breathtaking seaside villages of Cinque Terra. Shopping was, of course, a must everywhere we went, as well as daily trips to a “gelateria” to savor every lick of the best frozen treat known to man! We quickly learned the secret of picking the best places to get this heavenly creation that only the Italians really know how to make! We were constantly on the go, enjoying a variety of activities including: a seven-course dinner at a beautiful Italian villa, complete with music and dancing; a visit to a winery, where we learned how to “see, swirl and sniff” wine like the professionals; a cheese farm where we learned how they make cheese from sheeps’s milk, then, were treated to a lavish lunch. In Borgo a Mozzano we visited the World War II Museum of Liberation where we learned the incredible story of “the Gothic Line” and were guided through an intact Nazi bunker which was recently opened by the government – a truly chilling experience!! We were welcomed into a Tuscan kitchen where we learned to cook with their master chefs; and finally, we ended our tour with a seven course farewell dinner at a fantastic Tuscan restaurant, where the glorious view from the top of the hill was as unforgettable as the elaborate dinner they prepared for us. This was truly one of the best travel experiences I’ve ever had! Next bucket list destination —southern Italy’s Amalfi Coast and the island of Sicily! !